What’s artificial intelligence got to do with it? Artificial intelligence (AI) and what it will mean for mankind is a hot topic in the media now. We are, we are told, at the beginning of the next wave of an industrial revolution, the fourth industrial revolution (4IR) and this time, the wave is being driven by AI. While Elon Musk said that AI ‘is a fundamental risk’ to human civilisation and the late Stephen Hawking warned against the dangers of it replacing humans, there isn’t any doubt that AI is here to stay. We already use AI and machine-learning technologies in everyday life, whether it’s setting prices on Amazon, tracking your Deliveroo order to your door, or receiving recommendations for music you like on Spotify. What I’m intrigued by, however, is what is happening on the health front and what can be achieved there. The adoption of AI in healthcare is growing. 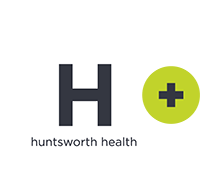 Predictions from the new report Worldwide Health Industry 2018 Predictions, from research and consulting firm IDC Health Insights, say that ‘by 2021, 20 percent of healthcare and 40 percent of life science organisations will have achieved 15 to 20 percent productivity gains through the adoption of cognitive/AI technology.’ For the healthcare systems and patients, that must be a good thing, leading to improved care for patients and a more sustainable future. AI tools are already in use in major disease areas e.g. in cancer-analysing clinical images to identify skin cancer subtypes, and an AI system for neurology used to restore the control of movement in patients with quadriplegia. Researchers have also used machine learning to identify how individual stroke patients might respond to different medications based on the unique structure of their brain! There’s no doubt that AI can do seriously impressive stuff and it’s no surprise that Google, Microsoft and IBM have recently moved into the AI healthcare space with Apple and Amazon expected to follow suit. But for most of us AI is an enigma and we need more understanding of this emerging technology and how it impacts our health and wellbeing. Hopefully, if it’s handled right, AI will bring substantial benefits in managing our health without risk to our independence, and certainly we need help in collating those mountains of data! What do you think about AI? Tweet us @TonicLC to share your thoughts. Posted in UncategorizedTagged AI, artificial intelligence, health IT, technologyLeave a Comment on What’s artificial intelligence got to do with it? Recently we had the opportunity to venture up to Times Square for the NYC Sysomos Summit and got a refresher on all things social analytics. To get you up to speed, Sysomos is an insights-driven social platform that we use for social monitoring, listening and analytics. 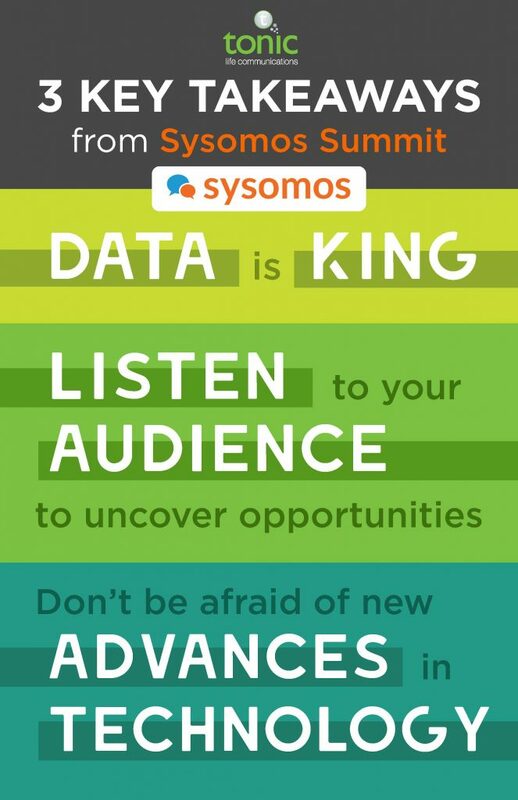 At this year’s summit, Sysomos brought together experts from companies like Google, Reddit and WWE, who each shared a unique perspective as to how digital data and analytics drive their business decisions. The speakers shared what it takes to succeed in the modern digital age. Here are key highlights. Data is KING. This point was stressed in sessions throughout the entire day—data, data, data. Too often companies push out social media content without taking the time to gauge reactions—both positive and negative—to those posts, or they measure social media performance in a silo. Because social media has become a focal point for new, loyal and potential customers to voice opinions about the product or services offered by a company, taking an integrated approach to analytics is imperative. It not only provides companies with the means to understand its competitors and trends within the space, but also taps into consumers’ opinions which allows a greater understanding as to where improvements can be made. Listen to your audience to uncover opportunities. We hear this all the time, but blindly posting content without understanding who they’re aiming to reach and why, along with identifying the best platform to reach them, prohibits companies from getting in front of people who are most likely to discover or react positively to their business. Elizabeth Motta, Director of Talent and Data Analytics at WWE, shared how the fan-driven #GiveDivasAChance campaign completely altered WWE’s programming. Social listening led to the creation of a women’s WWE division – and lots of happy fans worldwide (more than 850 million, to be exact). Don’t be afraid of new advances in technology. Summit speakers pointed to artificial intelligence, voice technology, and increasingly live social experiences (e.g. Facebook and Instagram Live) as trends to look out for in 2018. Be prepared to adapt to available consumer touchpoints and look for smart ways to engage in an era of utility-seeking, status-sharing consumers. Some people never meet their hero, but I gave birth to mine. My daughter, Angelina, was born with an incredibly rare disease called Neonatal Marfan Syndrome, which is a connective tissue disorder. There is no cure. Angelina was born on February 5, 2008, and just 23 days later, the very first Rare Disease Day was held. I am truly amazed at how far society has come in raising awareness of rare diseases in the last ten years, and I remain hopeful for what the future may hold. Get the right diagnosis. Initially my daughter was diagnosed with Beal’s Syndrome. I didn’t learn she had Neonatal Marfan Syndrome until she was 10 months old. Find a support system. I was desperate to find other moms like myself and canvased every corner of the internet to find them. Discovering The Marfan Foundation was life-changing for me. I am still friends with a mom in Australia through an amazing platform they have called NMF Connect. Build an integrated medical team. I saw eight different specialists ranging from orthopedic surgeons to cardiologists. Making sure they all talked with one another and were aware of what everyone else was doing saved me a lot of time. Angelina died in 2010, so being able to continue to work in the rare disease space helps me to feel like my daughter did not die in vain. I am reminded each year on Rare Disease Day of all we have accomplished and everything we have left to overcome. The kindest action a person can do is to encourage others despite their own pain. We are all worth a cure. Never lose hope.